Please contact your local or mail-in pharmacy for prescription refills and, whenever possible, put yourself on their automatic refill program so they can contact us without your asking them to. The pharmacy then contacts us securely by our e-prescribing system. This also helps to avoid errors and ensures correct medication identification. Please allow 2-4 days for routine refills. Prescriptions for narcotics and controlled substances often create special circumstances and may require you to contact us via our Patient Portal or by phone. Please note that we do not prescribe or refill opioid or controlled substances on nights or weekends, so plan accordingly. What do I do for refills if I use a mail order pharmacy? Please put yourself on an automatic refill with your mail order pharmacy so that they can contact us for any needed refills. The pharmacy then contacts us securely by our e-prescribing system. This also helps to avoid any errors and ensures correct medication identification. We can also give you written prescriptions during visits. We do not as a rule fax or call in medications since this increased the likelihood of medication errors. How do I get my lab and procedure results? It is our intention to keep all patients informed regarding test results. Typically, we will contact you as soon as results are reviewed by our clinician. If you have not heard about test results within 7 days, please contact us. The Patient Portal section of this website is a great way to review your labs and receive messages from our office. If you do not have a personal portal account, we encourage you to set one up so that you may view results at your leisure. Often your clinician will send a personal message explaining the results you see. There are even free I phone and Android applications to link you to our office. How do I talk to my doctor or nurse practitioner? We believe medical advice is best given face to face and encourage you to discuss your needs during scheduled appointments. For questions that may not warrant an appointment, you can use the secure personal patient portal section of this website to contact us. Your message will be reviewed by a nurse on the next business day and submitted to the appropriate clinician. Phone calls to the office during business hours are also reviewed by a nurse who can discuss your concerns with clinician as necessary. If you feel you have a medical emergency, please call 911 or proceed directly to the emergency room. Will my doctor take care of me in the hospital? All of our physicians admit to Warren Memorial Hospital and provide 24 hour inpatient services including ICU, labor and delivery, and newborn nursery. Our physicians take turn on call and work a week at a time in the hospital, so you may be seen by one of our partners. We also have excellent relationships with specialists throughout the region should you require referral to a larger hospital. What do I do with paperwork that I need help filling out? Please bring any special forms or paperwork with you to your office visit. Read the forms carefully and complete your portions prior to your visit. Please also note that we will also fill out forms between visits for fees starting at $20. If you feel you have a medical emergency, proceed to your local emergency room or call 911 for assistance immediately. Do not delay emergency care in order to contact our office. One of our physicians is available on call at Warren Memorial Hospital 24 hours a day, 7 days a week. The physician on call is available for urgent questions that do not require emergency care but cannot await office hours. To contact the physicians on call, please call Warren Memorial Hospital, 540-631-0300, and ask for the Front Royal Family Practice physician on call. We do not refill opioid pain medication or controlled substances on nights or weekends. What if I need chronic refills on controlled substances? Our office is implementing a new policy in regards to controlled substances. We are mandated by the State of Virginia and the Federal Drug Enforcement Agency to maintain a high level of regulation of these substances in order assure proper treatment and avoid over treatment. In order to be compliant with these regulations we will be making changes in our practice. We will be providing patients with copies of our policies and continue to strive for high quality patient centered care in partnership with our patients and their families. How do I get lab work done? We offer laboratory specimen collection by our trained nursing staff right here in the office. If you need lab work before or between appointments, please schedule a nurse appointment. 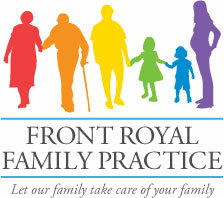 Request appointments by phone or through the personalized patient portal section of this website. Most major insurance companies work directly with our laboratories. If you are uninsured or your insurance company does not participate with area laboratories, we may have to bill you directly for lab services. We encourage you to visit our office for evaluation and appropriate referrals for specialist care. We have a trained referral specialist in the office who can work with your insurance plans and specialist offices to facilitate appointments and avoid delays.